I'm telling you the Opera house pictures never get old for me. I'm not sure what it is but everytime I run across one of these I have a smile on my face. Home stretch here folks. These are the last of the pictures that highlight the things I'll miss about living in Sydney. I'm sure there's stuff I've left out. It's been 4 months now since our return and I'll confess that I miss it more and more. It was such a different life. Anyhow onwards and upwards. Apols (that's what they say there) in advance for jumping around but I went on a sweep for the last pictures I might have missed, so it's all over the place. Ok this is going to sound really really stupid. But that plastic box pictured above is a standard "take away" box. In other words if you order take out or ask for a box to take stuff home (beware some places don't let you) you will get your food in a container like the one above. Sometimes it's black on the bottom, sometimes it's twice the volume (deeper but same lid size) but for the most part it's always that container. Why is this awesome? Here's why: 1) it's re-useable/recyclable , 2) dishwasher safe, 3)microwaveable. 4)EVERY LID fits on EVERY OTHER box. The exception is the soup bowl type which is a similar bowl with a lid that is likewise more or less universal. 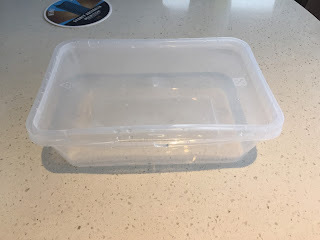 BAM tupperware solved. Bam Bento Boxes solved. One more observation here, is that this little box is enough food for lunch. It won't fit "American" sized portions of food or lunch, but no restaurant in Australia serves the generous portions we're use to in the US. I never acquired the taste of Vegemite however Australians seem to really love the stuff. 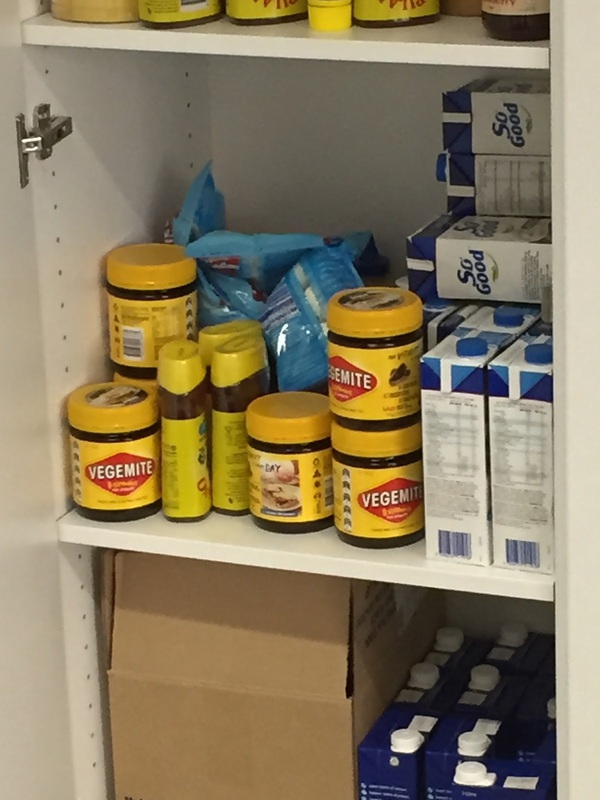 Here's a picture of our cupboard at work, full of Vegemite (the shelves above had Vegemite too)! It's got this weird mushroom taste to it. Ever quarter I would get some toast smear on butter and the thinnest veneer of Vegemite to see if it had grown on me. Nope.. As a parting gift my team gave me a custom jar with my name on it and sent me an extra tube of the stuff as a care package they mailed to me. I miss those folks. 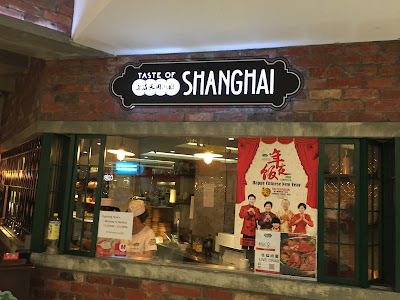 Favorite quick authentic chinese take out? 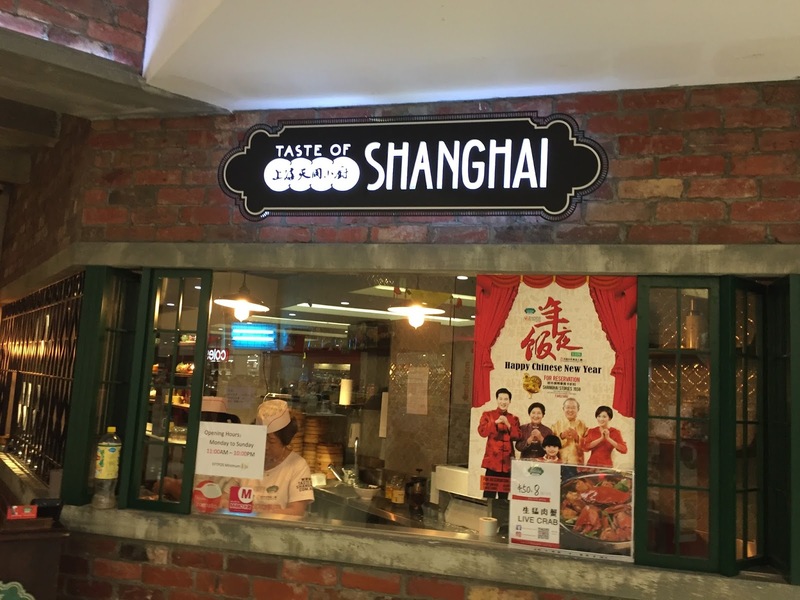 Once again in world square: "Taste of Shanghai". Din Tai Fung still my favorite, but for the budget real deal Chinese food it was a goto. Daiso, it's a japanese dollar store. I managed to snap a picture of it. 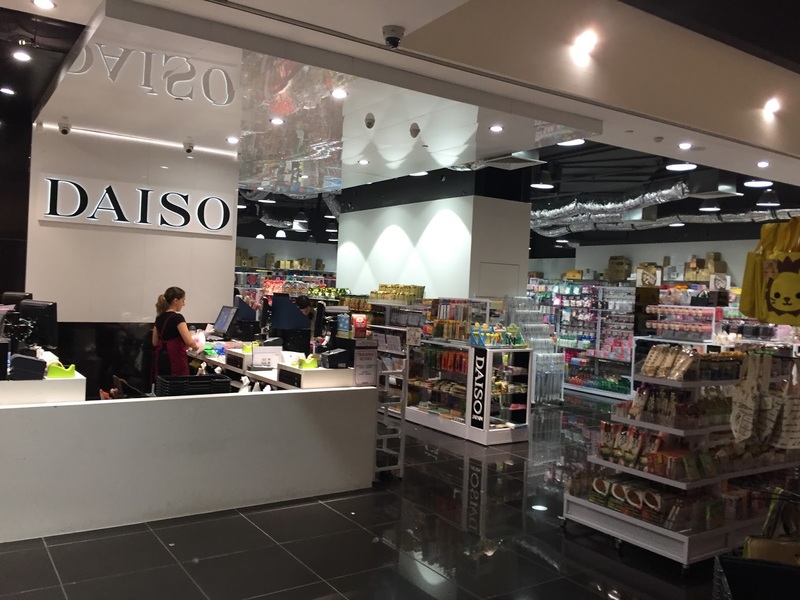 I realize they have Daiso in the US (just not here in Austin) but they had like 7 in Sydney. Basically it was a dollar (well $2.87) store with the best kitchen gadgets and stationary even minor tools. 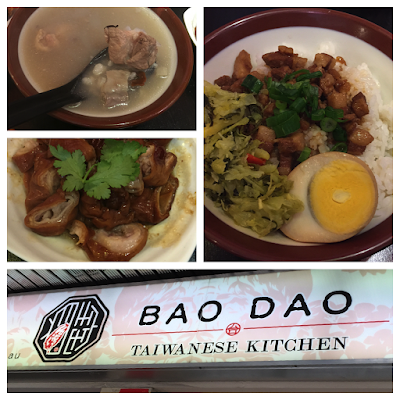 Bao Dao located in Chatswood (one of several predominantly Asian suburbs) serves some of the best Taiwanese food. My wife asked me to replicate several of the dishes. One of the things I missed the most while over in Sydney was American BBQ. What they call BBQ in Australia is what we call grilling. 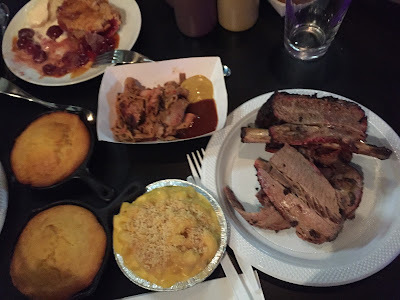 There's no low and slow meats, however we did have Jazz city BBQ in Surry Hills, which was run by a guy from Michigan. His beef ribs were phenomenal (that giant "fred flinstone" rib on the right). It was quite unfortunate that he closed the location. There was frequently a line out of the door so I'm not sure what happened. We made a lot of great friends while in Sydney and we'll miss them all. Especially this little guy, Milton is his name. 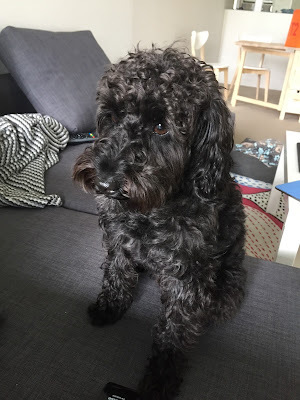 He is our neighbor's dog and we baby sat him occasionally. He always loved coming to visit since I would give him bits of salami I had in the fridge. 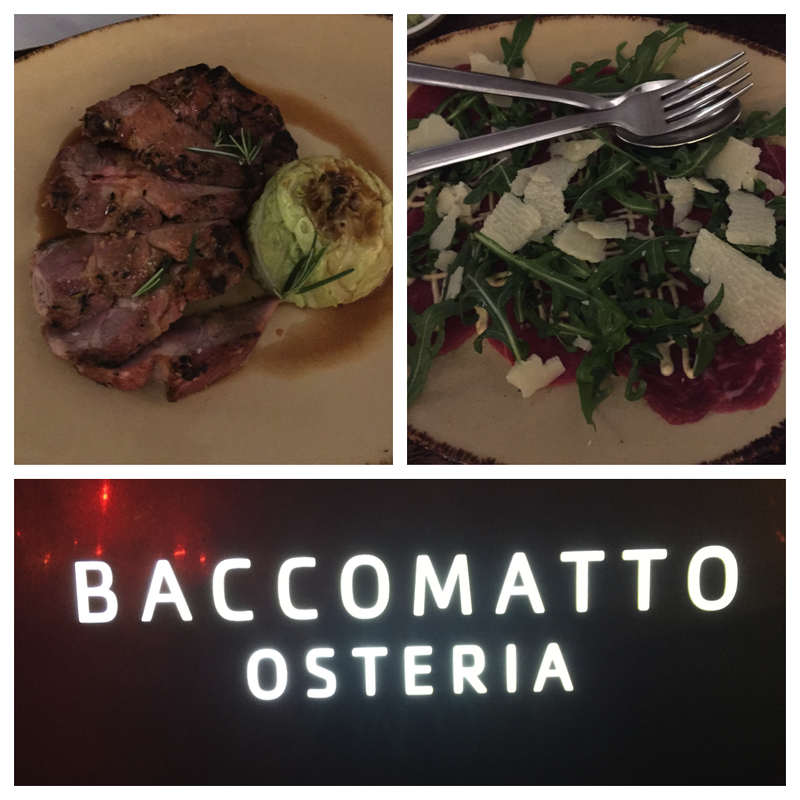 Speaking of our awesome neighbors/friends: They introduced us to Baccomatto Osteria in Surry Hills. Our favorite Italian place the menu changes quite often and they have daily specials written up on their chalk board. We went to this place a lot. Momofuku was one of our best dining experiences in Sydney. 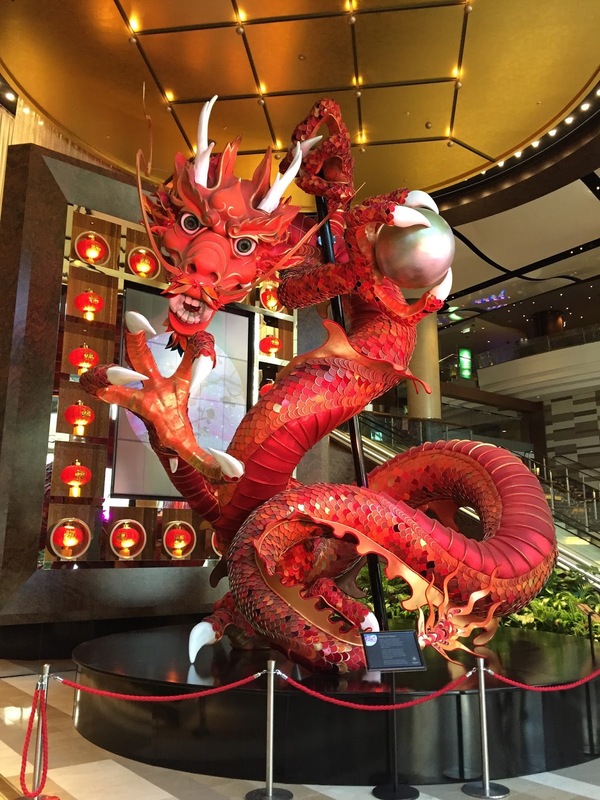 It's located in "the Star" casino. I know there are David Chang restaurants in the US but we haven't tried them. This is definitely a must try for food lovers. 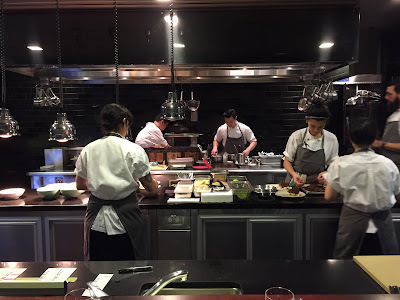 It's an open kitchen and they you get to watch everything like a well choreographed dance. 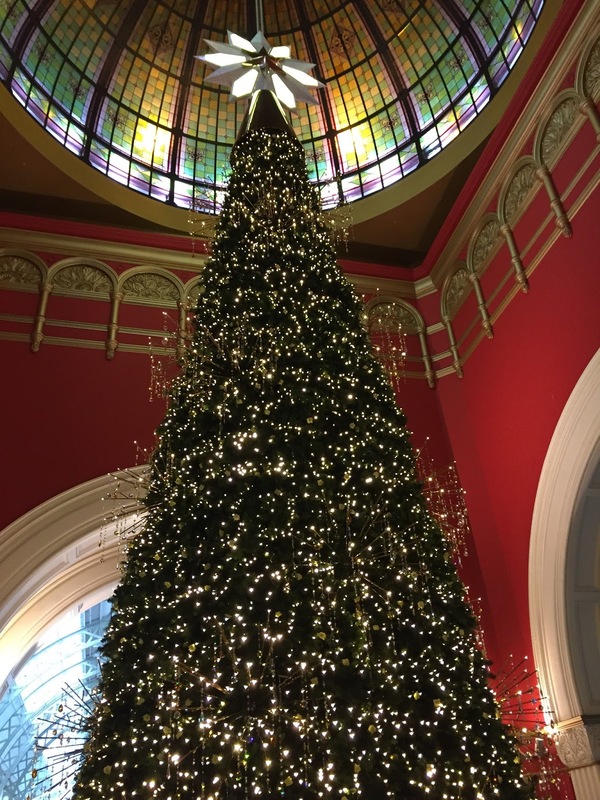 The Australian Museum of Natural Science right off William street and park street (next to hyde park) is Australia's oldest museum. As my friend said, it's definitely an old school museum with dinosaur bones and all that but worth a look. 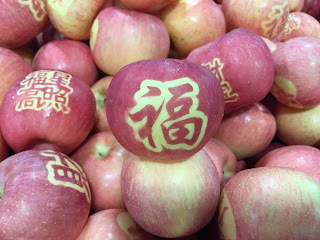 As I said before they really get into Lunar new year. Always very festive. Dragon. Since it was the year of the Dragon our first year there. 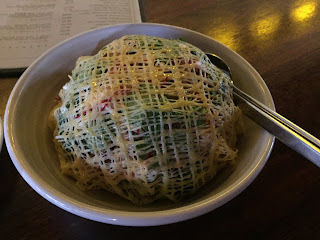 Long Grain restaurant in Surry hills was a favorite for the above "egg net" thai salad dish. The rest of the menu is quite good as well. 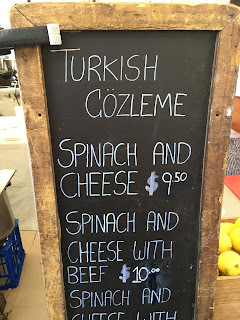 I never encountered a Turkish Gozleme until I visited Sydney, but they are everywhere here. It's something like a tex-mex Quesadilla that is stuffed with a variety of toppings and pan toasted but the "tortilla" is a thinly rolled out dough that is very crispy and flaky similar to a Chinese breakfast biscuit. I'm very partial to the eggs, Turkish sausage and feta from these guys up in "the Rocks" on Saturdays. 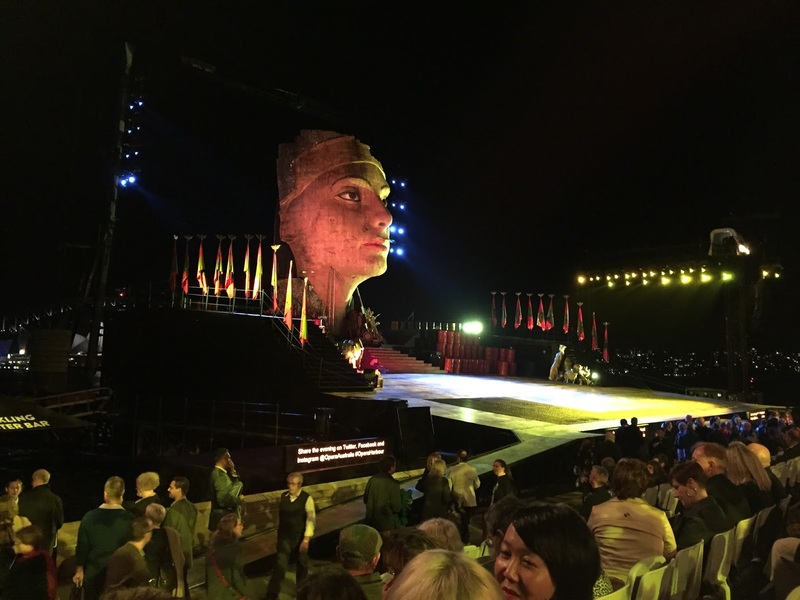 While you're in Sydney go see an Opera. 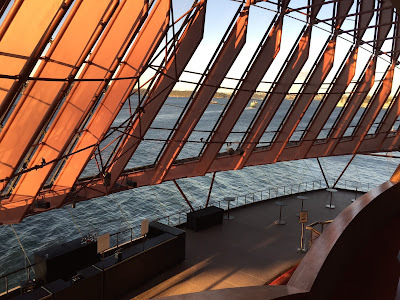 We didn't go into the opera house to see a show but we should have. Instead we did go see this great outdoor opera. The sets were elaborate and they did a wonderful job with acoustics despite the open air location. 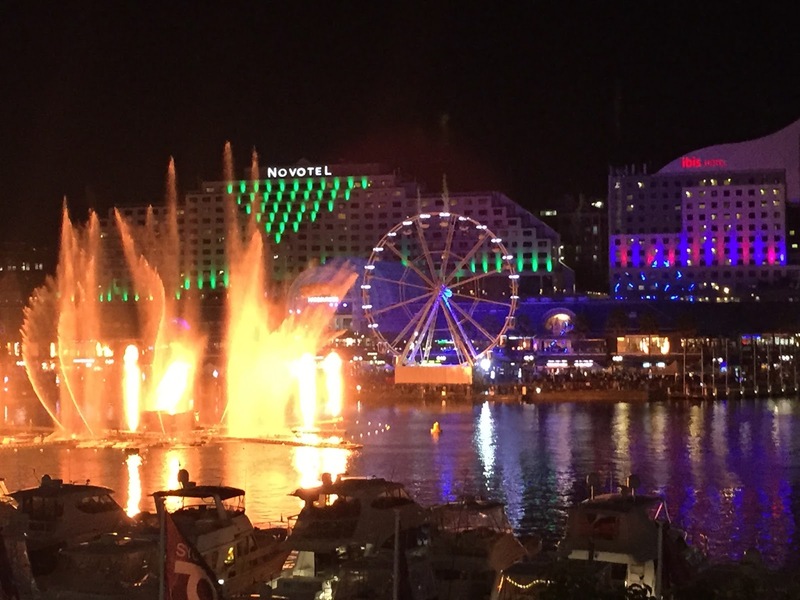 Vivid Sydney is a time of year that the whole city is lit up in lights. It's a neat way to take in the night sights and get out. View of Vivid Sydney from Darlingharbour. Yes as always fireworks. Cafe Paci has been a "pop up" restaurant for quite some time now (does it still count as a popup?). When we went it was a 13 course meal. A bit pricey but very interesting food. I also like the fact that they named the popup after what was left of the sign of the previous restaurant. 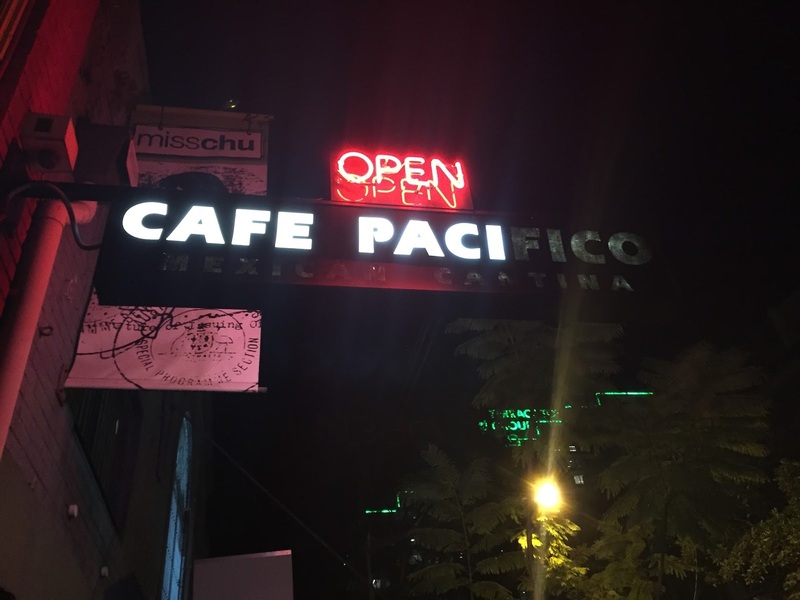 (Cafe Pacifico). The Royal Botanical Gardens. 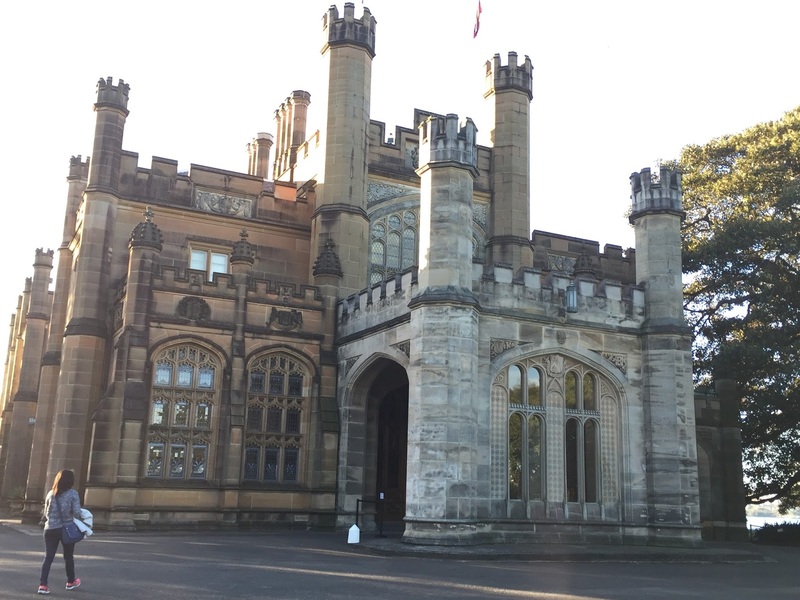 This is a picture of the "governor's castle". As I mentioned in previous posts, there are lots of great big parks in the city, it's a great perk to have in such a big city. 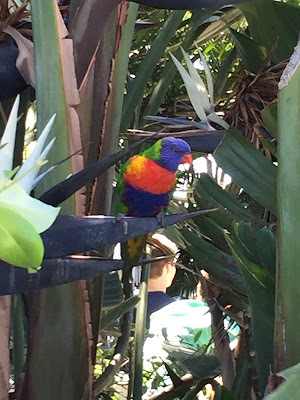 The Botanical Gardens are very nice, great place for a picnic and there's lots to explore. There are a *lot* of sushi train or conveyor belt sushi restaurants in Sydney. Most of them are pretty meh and if you compare to say Uchi, Uchiko, or Soto here in Austin you'll be pretty disappointed. 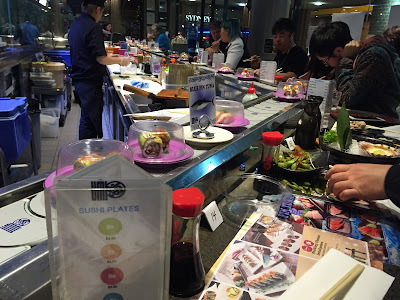 But if you need a quick sushi fix with a very reasonable price it's a good option. Our favorite was Umi sushi down by Haymarket. (there are multiple branches but this is one of their main ones). They have a pretty good variety of rolls and fish. The plates are color coded for plate prices. Here's a video of the chef making tamoyaki. It was hypnotizing and delicious. The Royal Randwick race course. Unfortunately I did not get to see a race here, but it was pretty cool to see it while it was completely empty. There's a pretty large national obsession with horse racing here. The Melbourne cup actually is basically a national holiday since everyone is off that day. 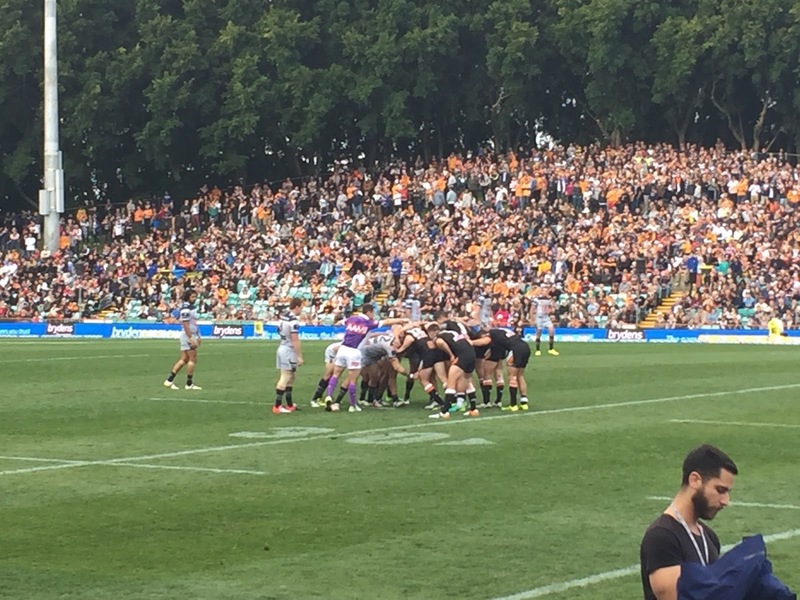 I suppose it's pretty exciting but the race is over in 3-4 mins. I watched it and asked my friends, "so was that it? there's not more?" 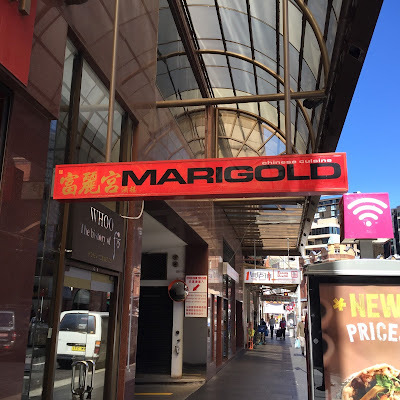 We favor the East Phoenix but another great Dim Sum place Haymarket/Chinatown is the Marigold restaurant. As my cousin put it, "yup it's legit, good food and full of waiters that are rude to you". Truthfully the staff can be a bit pushy but it's all about efficiency here, you don't wait very long before the carts swarm you and your table is full of food. Ok this place is closed but I'm putting it up here because it was awesome. Lu Wei is a braised Taiwanese street food, basically you go around pick your ingredients and they braise it in this giant cauldron of soup filled with spices. 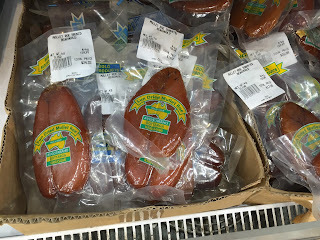 Great for the winter. My wife was super excited when this opened and there were lines of people for a while but it didn't quite make it. 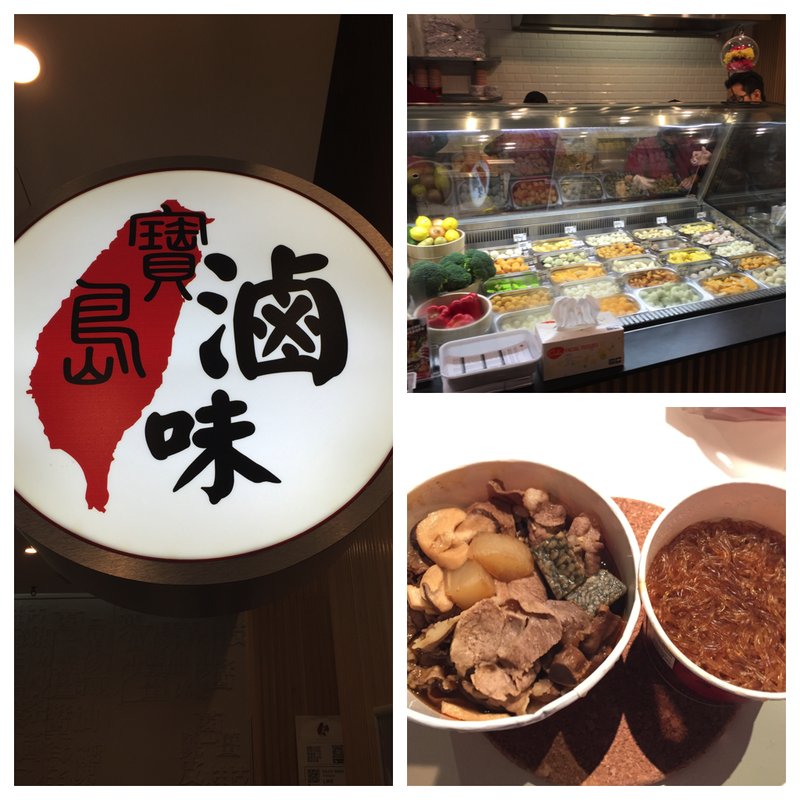 There's lots better in Taiwan of course but this was the only thing like it in all of Sydney and the surrounding suburbs. 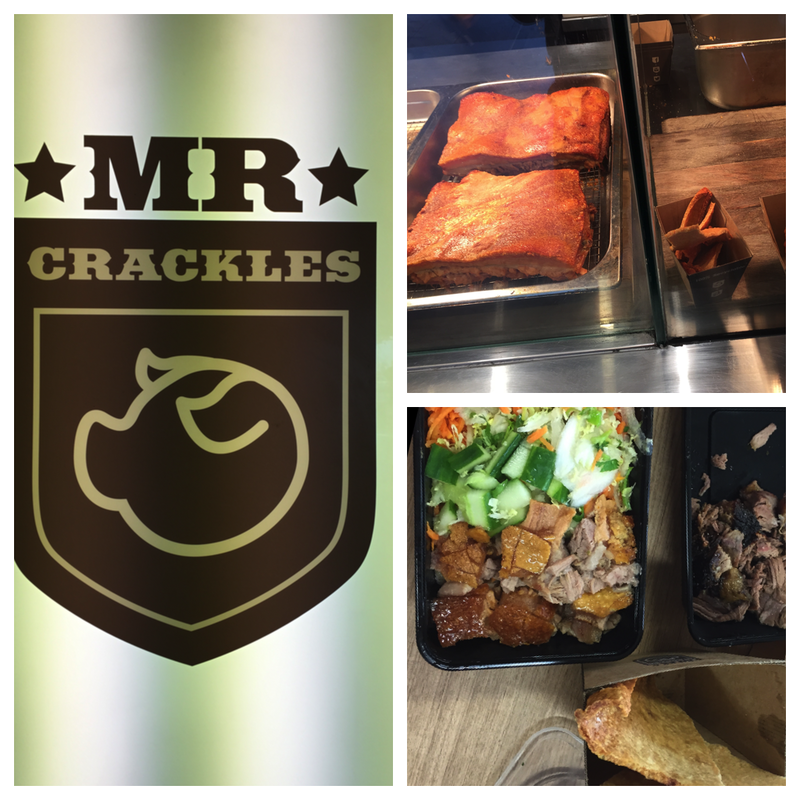 Mr Crackling. They sell you whole sheets of fresh pork crackling. There's not much else to say than that really. I realize this picture is a repeat. 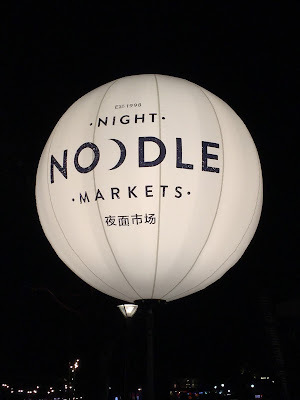 Sydney puts up a lot of food festivals, but our favorite is the Sydney Noodle night market. Lots and lots of food very festive best part it was right down the street at Hyde park every year. This is not the best picture of the tower but it's the best I could find. 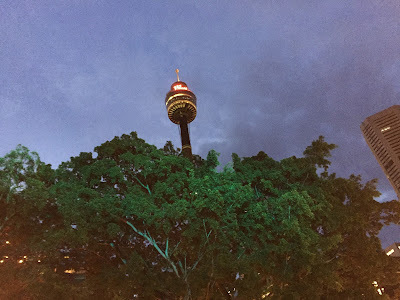 Pretty much every big city has a tower these days, but I really enjoyed visiting the Westfield tower, it was a nice view of all of Sydney and quite peaceful. 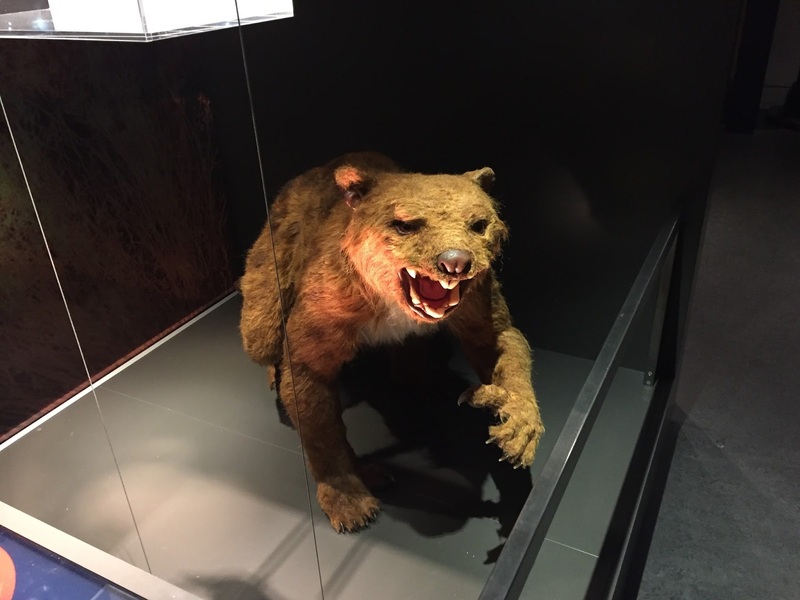 Every visitor we had taken there seemed to enjoy it. Seriously, who has birds this color? beautiful! Much better than the grackles and pigeons we have here at home. 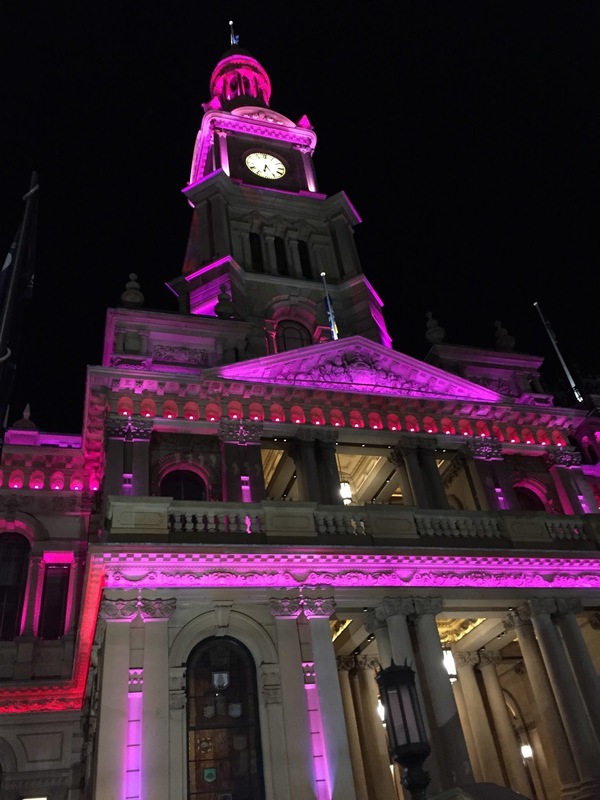 QVB. The Queen Victoria Building, a place of high end shopping some hidden treasures for food a great hobby store and has an awesome 4 story christmas tree running up the middle decked out in Swarovski crystals. A night they don't close the building until late but all the shops are closed (it has an access to the train station) it's a great place to take a picture, it has an old school architecture and during the holidays the lights are pretty neat. 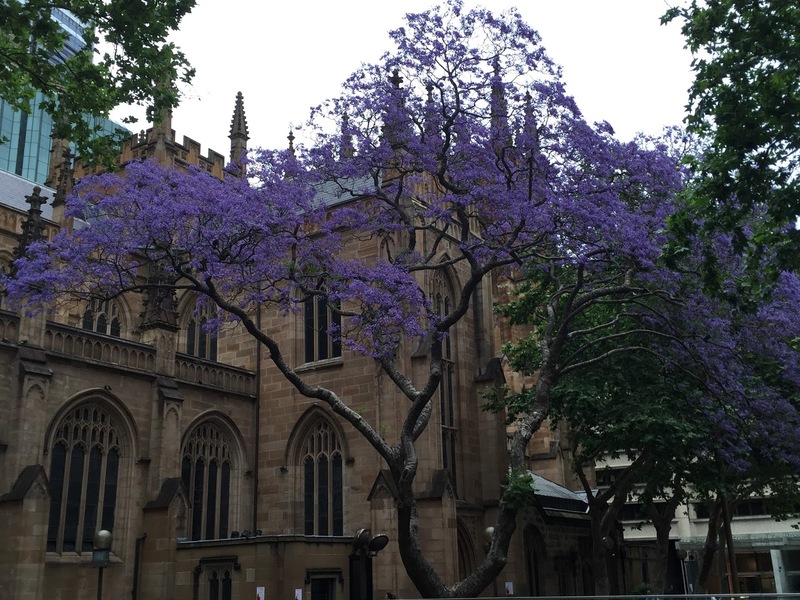 Jacaranda tree. This tree is a transplant from South America apparently but they are everywhere. For several weeks during the year whole areas are this purple color. 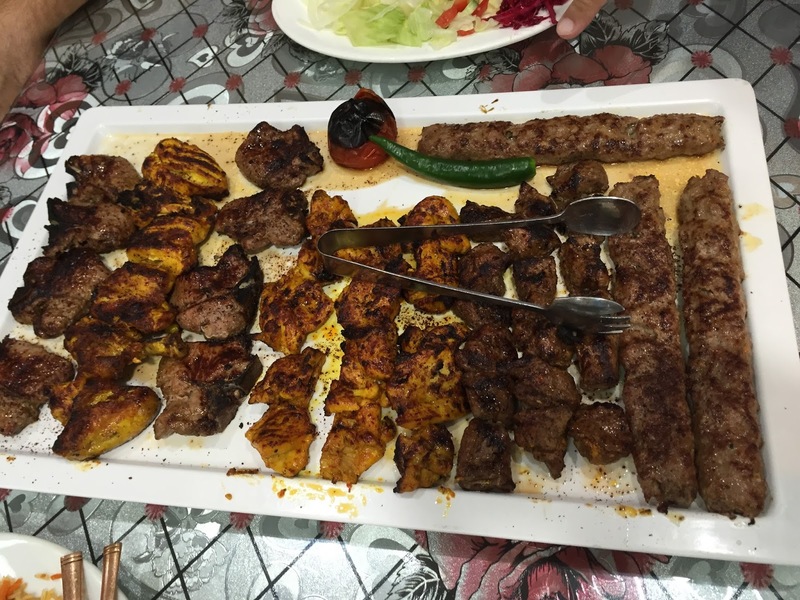 One of my friends would occasionally get us all together and take us to his favorite middle eastern restaurants. (he's moving to Austin, so I can't wait to see what he thinks of some of the local stuff here) Anyhow, I'll miss our outings and dinner talks. There is an often missed gem that you should go see. On the south east pylon of the Sydney harbor bridge there is a museum where you can go all the way to the top of the pylon and learn about the building of the bridge and get a magnificent view of the harbor. The door way is very non-descript but it's worth a hike up to see, you get to it on the street level not the "bridge walk" where you go over the bridge. It's one of those things that even the locals don't seem to know about. When I told my coworkers about it the reply was, "oh? there's a museum up there? I've seen people go up there but never been myself". Pilu at freshwater (beach). We had brunch there. Sardianian food very yummy. 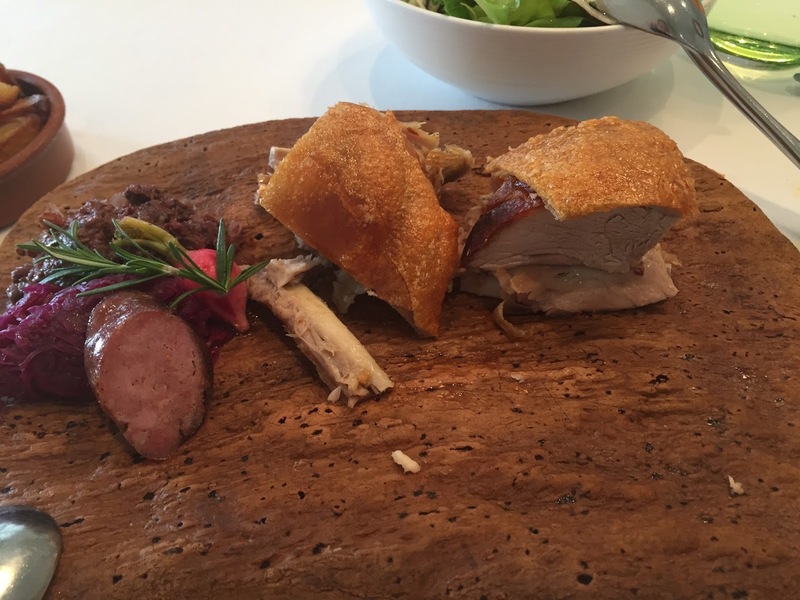 This was the roast piglet which is *the* dish people get. I wish there were more of it. Cockatoos, they are everywhere. 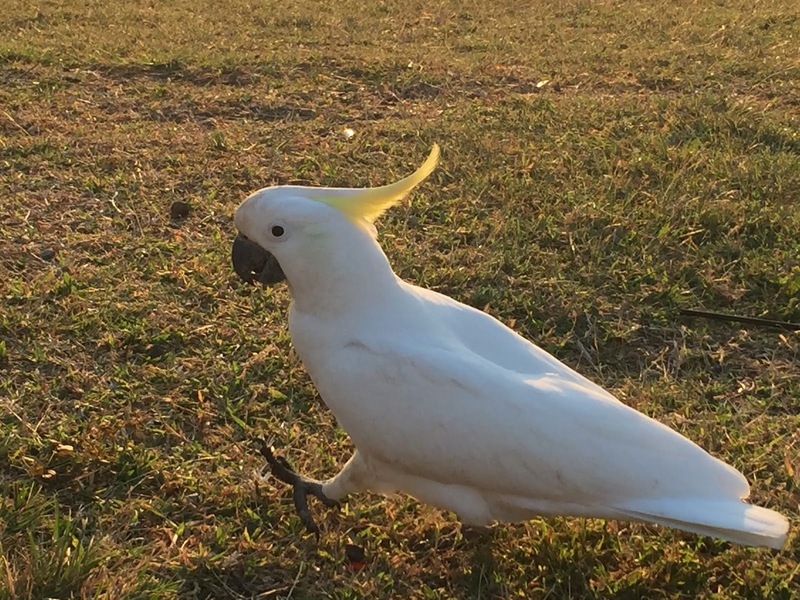 Cute but noisy. They let me rent a boat out in BarrenJoey. Lots to do in the Palm Beach area. I talked about St Mary's cathedral. You really need to go in and take a look. 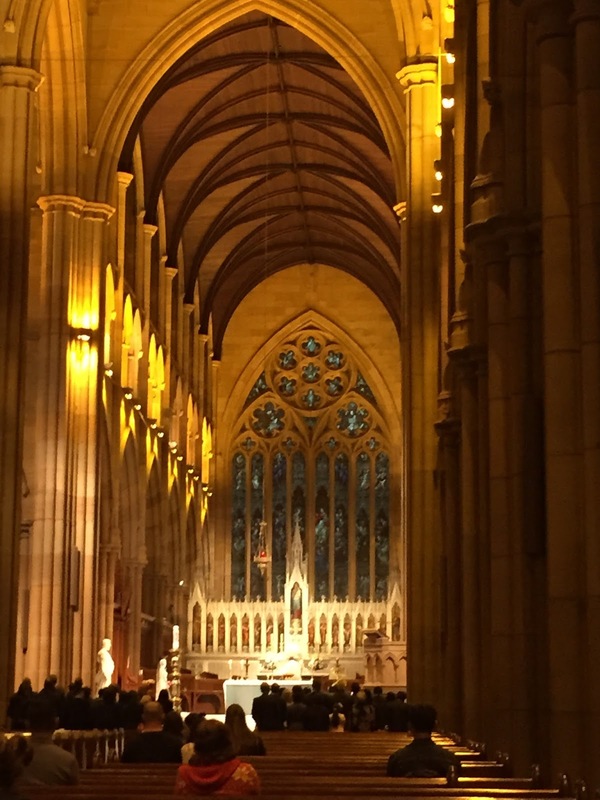 It's a beautiful church. 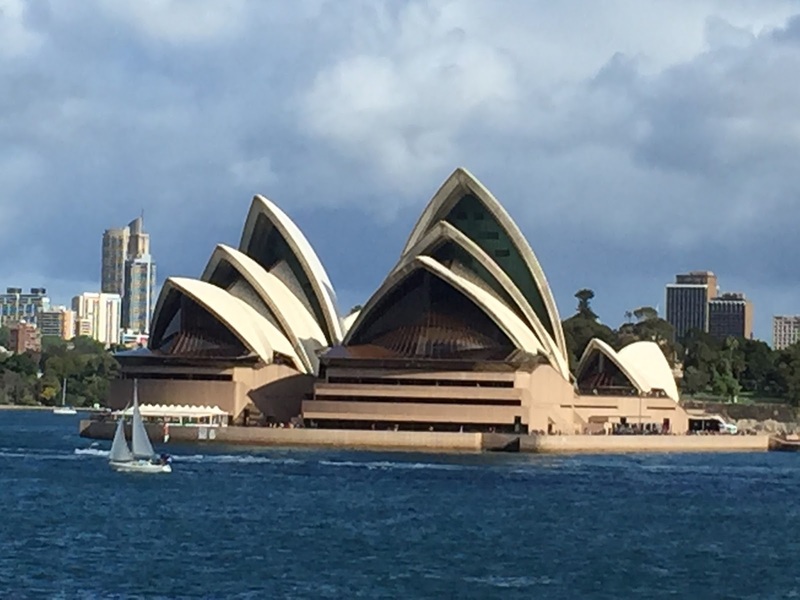 I know I've talked about the opera house but you should take a tour. The inside is as magnificent as the outside. And there are so many more theatres and rooms than the three big auditoriums. The place goes levels deep and hosts a lots of smaller performances in various room tucked under the main platform that the main auditoriums sit on top of. 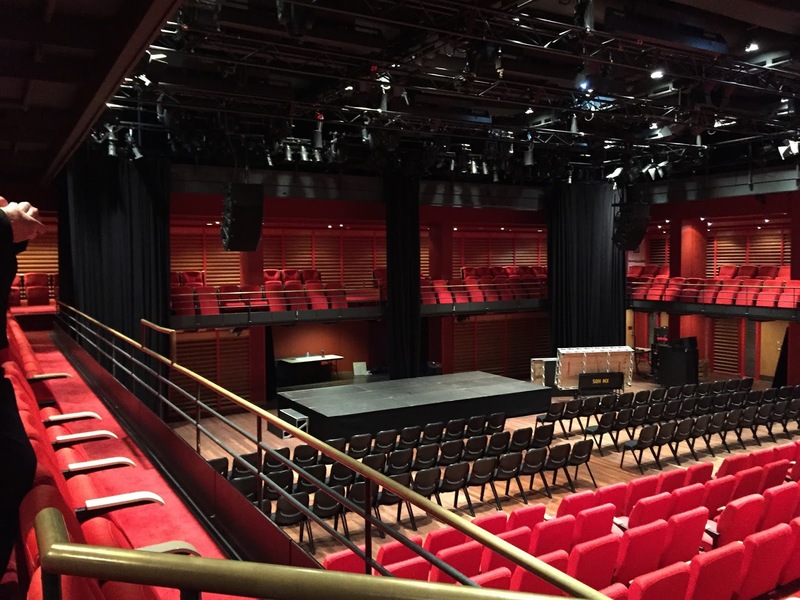 Above is one of the smaller theaters where they do some TV productions. There are 1000 (!!!!) 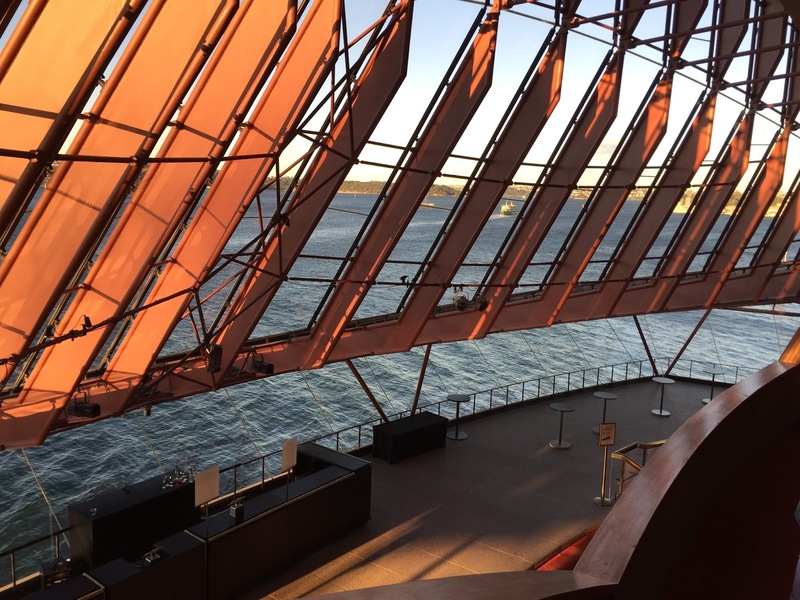 rooms in the Sydney Opera house! (I'm about to cause an argument. 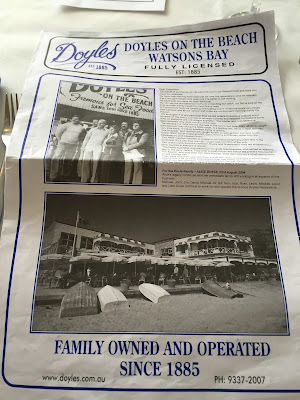 )Our favorite fish and chips place was Doyles at Watson's bay. It's kinda classier than their other establishments, but the fish was done really well here and there's lots of fish and preparations to choose from. More bridge and harbor. 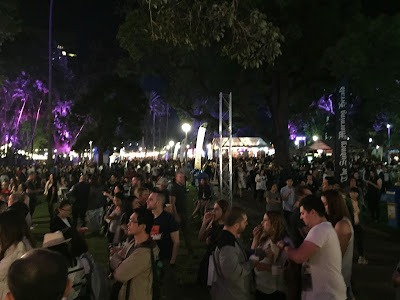 This is from the west side of the bridge from Dawes point. Less folks visit that part but there are some nice restaurants near there. Well start with the harbor and you end with the harbor. I'm sure there's a bunch of stuff I've missed, but these were definitely the minimum highlights. Two years flashes by really quickly and there's a lot to miss about my temporary home, if you go I hope you visit some of these places just make sure you take some time there, it's a long way to go and you might as well see everything while you're there!